Full compliance with DIN 2345 standard. I am here to make people understand you. Translation of Terms and conditions for partner sites participating in the affiliate program of one of gambling websites. Translate Company: Vadim is perhaps the best Russian translator we worked with. He delivers extremely high quality translations on time. WordSystem Ltd: Professional and 100% reliable translator. Jens Bierkandt: Fast delivery, solution oriented and on top willing to share knowledge about how to implement Russian on a website. Translation of several specifications for various HSE-related devices used on a drilling rig. Translation of service manual for a Multiple Opening Circulation Sub (MOCS), which is a circulation sub that allows unlimited cycling between drilling fluid flowing to the drill bit, and porting to the annulus at the tool. Transpac Technology Inc.: Good and professional! Scaffolding guidelines developed to ensure that scaffolds are properly designed, erected and maintained to provide both a means of access and a working place (in compliance with British standards for metal scaffolding). Translation of Memorandum of Association + list of shareholders of a Thai bank. Translation of a presentation introducing two new products for gas leak prevention. IGMI: Professional translator, always in time and very friendly! A pleasure to work with Vadim. Operations manuals and several drawings of an Italian shrink wrapping machine (namely its different modifications). Aerospace / Aviation / Space No comment. Contract for supply of aviation jet fuel in airports between a British company and an aviation company in Ukraine. "The company is looking for a complete new IT solution including several software components. This solution shall fulfil the needs of distance selling in general and especially the needs of multi-channel retailing with main focus on catalogue business. E-Commerce is expected to grow fast, starting with a level of currently 10 % orders from a web shop"
CONSENT AND NOTICE FOR BACKGROUND INVESTIGATION to be signed by applicants seeking employment (in accordance with the Fair Credit Reporting Act). A-A Language Services, Inc.: Excellent work! Translation from Chinese English, but thanks to my experience in the field it was OK. Translation (from English into Russian) of VISEL VSC 1020-M lathe programming guide. Translation of some 5 pages of ESCAAN application form (www.escaan.com) into Russian (http://www.escaan.net/wp-content/uploads/pdf/new-application-form-ru.pdf). Standard Ground Handling Agreement concluded between a Turkish company and a Ukrainian aviation company. Experience Years of translation experience: 15. Registered at ProZ.com: Aug 2010. Became a member: May 2011. 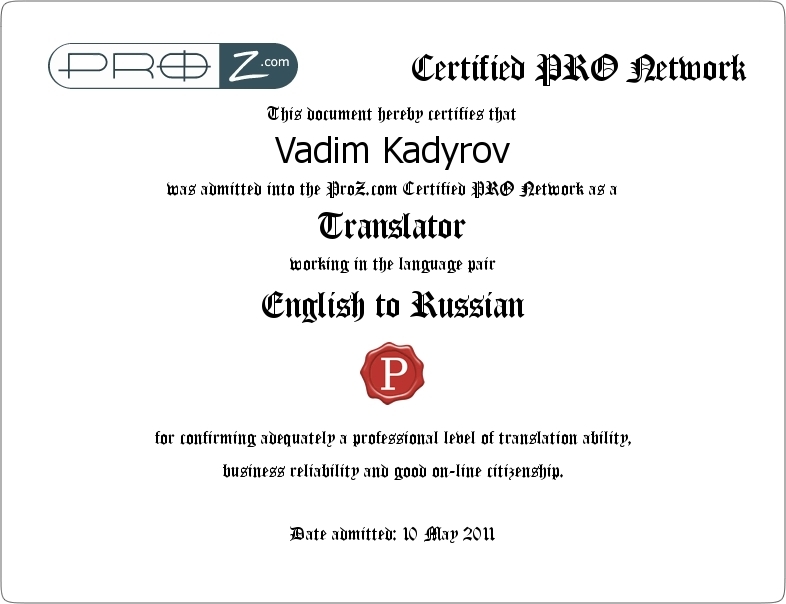 Professional practices Vadim Kadyrov endorses ProZ.com's Professional Guidelines. Proud author and coder of this free on-line counter of words, repetitions and numbers for translators in MS Office 2007-2016 and PDF files, with on-line quote calculator - https://t9ncounter.com. I am an experienced Russian-speaking freelance translator and JS/PHP coder (one of top 15 English-Russian translators in Ukraine according to PROZ.com, and one of top 30% of PHP coders - Upwork.com), with 10+ years of English-Russian translation experience and MA degree in linguistics/translation studies, offering high-quality translation services to both companies and individuals from any country. Having been an amateur radio operator of a club station (call sign is UR4QZF) for almost 12 years, I have a lot of experience in electronics, electrotechnics, telecommunication as well as physics in general. Moreover, after spending 2 years at a construction site of one of steel mills in Ukraine along with German, Indian, the UK specialists as their English/Russian/Ukrainian interpreter, I now have vast practical expertise in the industry (metal production, engineering technologies and procedures, civil engineering). Passionate and experienced full-stack web developer(JS/PHP/MySQL). Add here thousands of pages of business and marketing materials translated since 2005. P.S. Want to get the latest translation industry news? Follow me on Twitter - Vadim Kadyrov.